The 2019 Kawasaki KX450 is completely new. We don’t mean the usual year-to-year definition of “new,” where most of the bits and pieces of an existing model are massaged and get new part numbers. That’s happened to the KX450 several times since 2006, but looking back, the different versions blend together. The 2019 KX won’t blend anymore. It’s a completely different kind of Kawasaki. For that matter, it’s a completely different kind of Japanese 450 MX bike. Everything comes at a price. 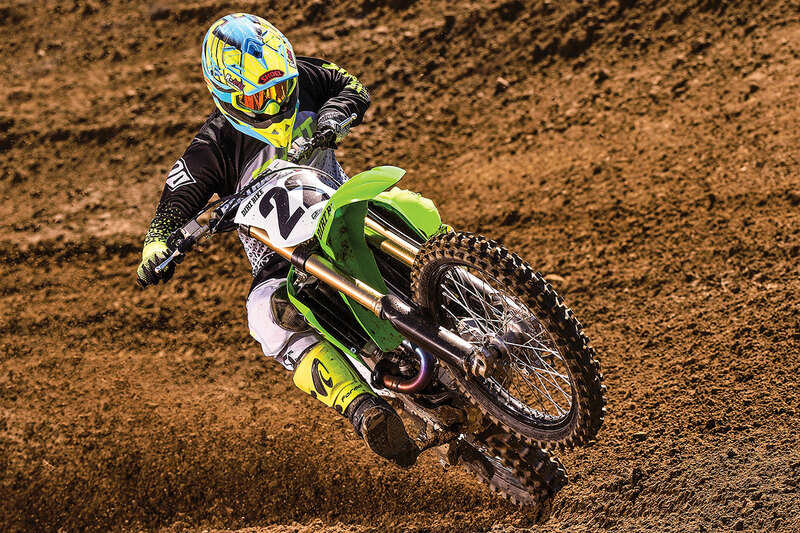 The new KX carries an MSRP that’s $450 more than last year’s bike. It’s still $300 less than a KTM. Motor changes were to be expected, and market forces more or less demanded electric start. The Kawasaki methodology in the past was to use as much of the existing bike as possible with new parts grafted into place. 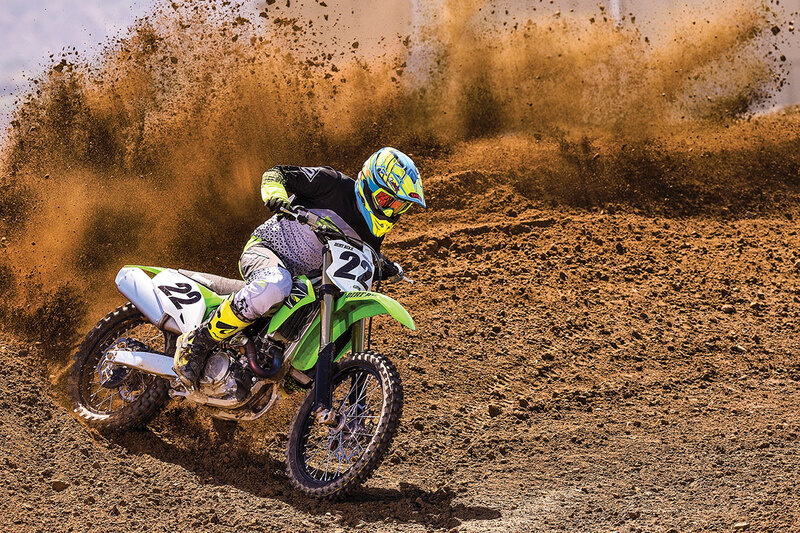 Look back to the first fuel-injected KX and you’ll see that philosophy in action. This time the motor was redesigned from scratch, and Kawasaki engineers weren’t timid about using successful designs from elsewhere. The clearest example of this is the use of finger-followers in the valve train. We’ve seen this design on the KTM 250 and 350, as well as on the 2018 Honda CRF250R, but this is the first time we’ve seen it on a 450. These are little levers between the cams and the valves. At first, it seems odd. Isn’t the whole point in DOHC to eliminate rocker arms? Apparently, the fingers are so small and light that they don’t introduce the drag and weight of the big rockers used on SOHC motors. They do allow much greater lift without the drawbacks of having big cam lobes (i.e., side loads and the need for stiff valve springs). The hydraulic clutch is a first for a Japanese motocross bike. Next on the surprise list was the hydraulic clutch. We figured this would never happen on a motocross bike from Japan. The twist is that even Eli Tomac’s works KX450 doesn’t have one. The factory Hondas ridden by Ken Roczen and Christian Craig do, but the feature was a no-show on the Honda CRF450R Works Edition for 2019. The one on the new KX450 is manufactured by Nissin and looks completely different from the one used by the Honda factory team. 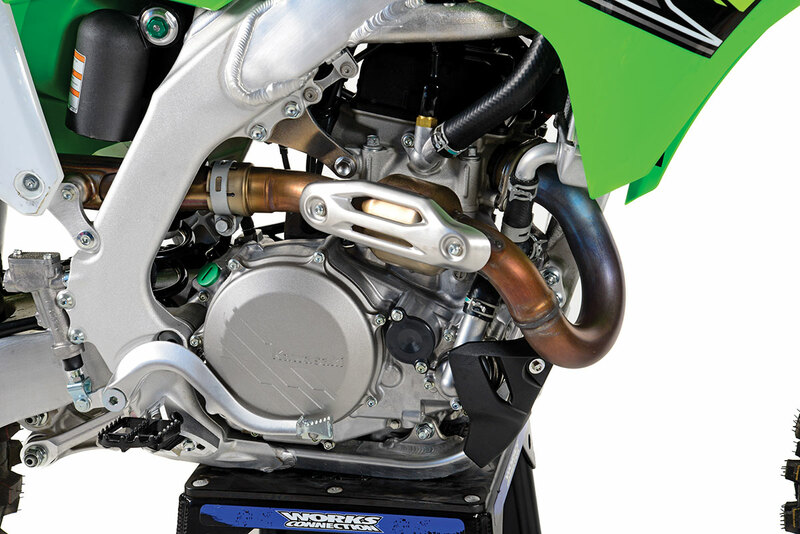 Kawasaki also spent some time with Keihin rethinking the throttle body. It’s 1mm larger now (44mm), but the biggest change is the orientation of the throttle butterfly. It now pivots with the top moving forward and the bottom moving backward when it opens. This is significant because the new fine-spray injectors are located at the top, so the fuel has a more direct flow down into the motor. We say “down” because the throttle body is angled more downward, and the motor itself is more vertical than ever, with only a 3-degree forward tilt. The center line of the cylinder, however, is offset 8.5mm forward, which is said to reduce overall friction. Here’s another first for a Japanese 450—the rod uses a plain bearing for the big end rather than rollers. Kawasaki introduced this on the KX250 first, and KTM has used this design for a number of years. The new piston is 17 grams lighter. The fuel pump is more compact and the shift drum is new. The rear brake rotor is now 250mm. The front is still 270mm, but it’s more powerful than ever because of a new master cylinder. On the chassis side of the ledger, the frame and swingarm went on a diet. The swingarm has always been comprised of a cast section and two extruded arms, but now those arms are longer and the cast part is smaller. Between that and the frame changes, there’s been a loss of nearly 2 pounds. All of that weight—and then some—returned in other places. The 49mm Showa fork, in particular, has good old-fashioned coil springs—two of them. The Triple Air is gone. No one will miss it much, but springs are heavier than air, and Kawasaki also gave the front end a great, big 22mm axle. When you add up all the gains and losses, the 2019 KX450 weighs in a touch heavier. On the fabulous Dirt Bike neutron scale, it’s 233 pounds without fuel, whereas the 2018 model was 231. That still makes it the lightest of the Japanese 450s, all of which are around the 240-pound mark. The lightweight champion of 2018 was the KTM at 225. There are lots and lots of other details to talk about here. The air filter is now accessible from the side. The brakes have been revamped; there’s a new master cylinder in front and a huge 250mm rotor in the rear. The exhaust is different, with a longer head pipe and a quieter muffler. A few things are the same too. 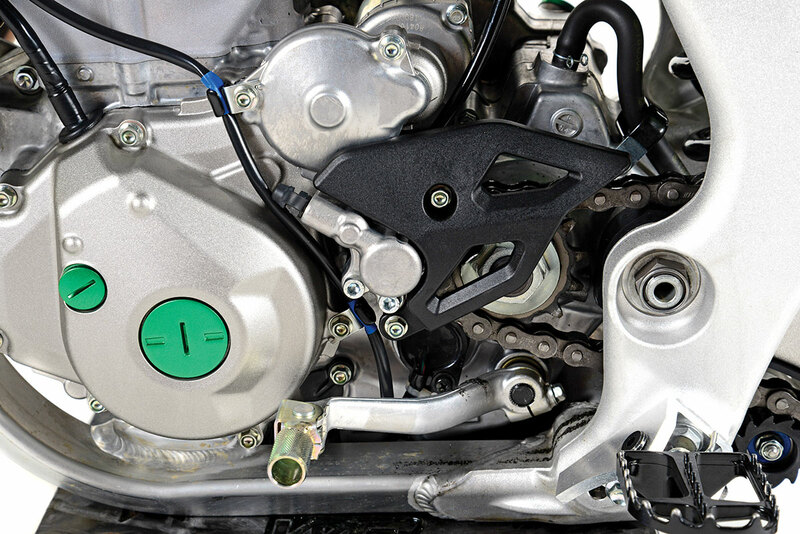 The KX still has launch control (a feature Kawasaki introduced), and each bike comes with three color-coded electronic couplers that allow you to richen or lean the EFI mapping. For further tuning, Kawasaki sells a handheld electronic calibration controller, but it will cost you $700. Kawasaki changed everything for 2019. The new KX gives up nothing. Imagine a big 250F that makes around 60 horsepower on top. That’s the new KX450. The motor is revvy, responsive and has a big top-end punch. Clearly, Kawasaki engineers wanted to close the power gap that existed between the 2018 KX and the Honda, Yamaha, KTM and Husky. It was pretty severe; on the dyno, the KX was 4 or 5 horsepower down. While we haven’t tested many other 2019 models, we can say with confidence that the new Kawasaki isn’t lacking power. It’s fast, and it revs like crazy. Every time the upper boundary for power is pushed a little higher, we wonder if we’ve reached the point of diminishing returns. Maybe we have, but the truth is that power is fun, and Kawasaki has done a good job of making it manageable. As we said, the bike revs and acts like a gigantic 250. It makes power with a smooth progression to an ultra-high redline. Down low, the bike might not even hit as hard as the 2018 KX did. If you remember, that bike was the torque champion of the 450 class between 5000 rpm and 6000 rpm. Now the hit is smoother and the power comes later. If you stay on the throttle all the way to the top, you better bring your A game. The KX is a brute on top. We tried the different EFI curves provided by the couplers. Last year we liked the standard (green) or the lean (white) ones best. Now, it’s either the standard or the black (rich). The rich one makes it just a little less nervous down low, which is beneficial on some tracks. One of the aspects of the KX that we really appreciate is the fact that it still feels light, despite all that power. We’ve long held that horsepower makes a bike feel heavy, but it’s not true in this case. 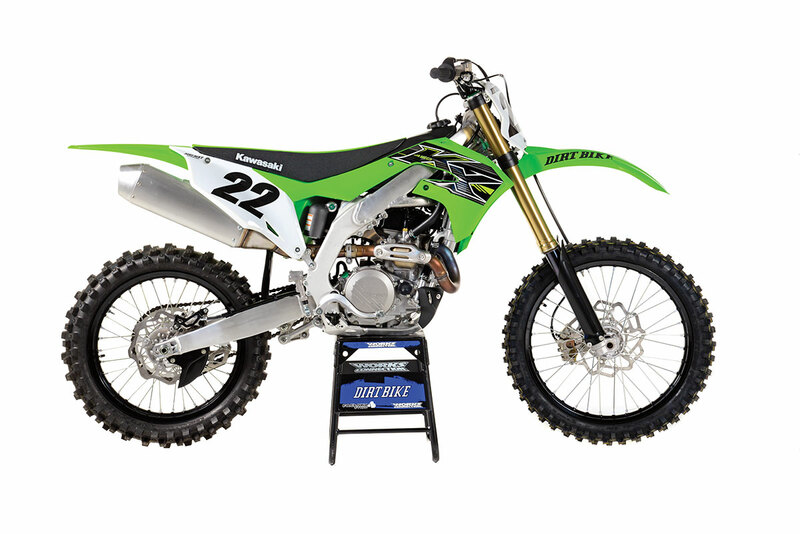 The KX feels much lighter than either the scale or the dyno numbers reflect. We love the way the bike handles. That’s one thing that hasn’t changed. Over the years, the KX has consistently been a very neutral bike. It started off much like the early Honda, but as the CRF became more and more hyperactive over the years, the Kawasaki continued to have that same balanced feel—medium stable, medium agile. The new bike hasn’t changed, but the class average has. Now the bike is very stable compared to its peers. Despite all the changes, you would still recognize the KX as a KX just by the way it feels. If any one feature has been rejected by the public in recent years, it’s the air fork. The Showa Triple Air fork that came on the 2018 KX450F could be made to work well, but you almost had to stumble on the right combination of air pressure and damping settings by accident. You could make the fork softer by adding air pressure, but despite all the phone apps and calculators that were supposed to aid in the process, riders were generally confused. The only exception to the air-fork rejection was the WP AER 48 on recent KTMs, but it was received well simply because it was simple and its coil-spring predecessor was so universally disliked. Now it’s safe to say that coil-spring forks are back, at least on Japan’s offerings. It turns out that while they were gone, they got better. The 49mm Showa that comes on the KX uses what they call A-kit technology. You have to understand that this is not an A-kit fork, which sells for almost $6000. The fork on the production KX does have some features that were originally introduced on works bikes, such as the titanium nitride coating on the inner tubes, the Kashima coating on internal parts and an oversized piston. Kawasaki also gave parts of this fork what it calls a “Dimplish” finish, which is a texture that retains oil. Even if the fork isn’t like what Tomac uses, it’s still very good and has very little stiction. This isn’t a step backwards to the 2014 spring fork. This is where that fork would be if it had received all the same engineering attention that was lavished on the air fork. Most riders loved it from the word go. It’s plush without too much dive. If you ride hard on a track that has big jumps, the stock settings are probably too soft. That’s easily fixed with a few clicks of compression damping. Big, fast riders might need stiffer springs, but that’s okay with us. We would rather have it that way than have it start off with Supercross settings. One drawback is that springs cost money while air is free. In the rear, the Kawasaki is good, just like always. Set the preload to 102mm or so and ride. We aren’t big fans of the new preload adjuster, which is made of plastic with a set screw. We change preload much more often than the average person, because test riders come in all sizes, and the plastic collar is already showing wear. How about that clutch? It’s good. 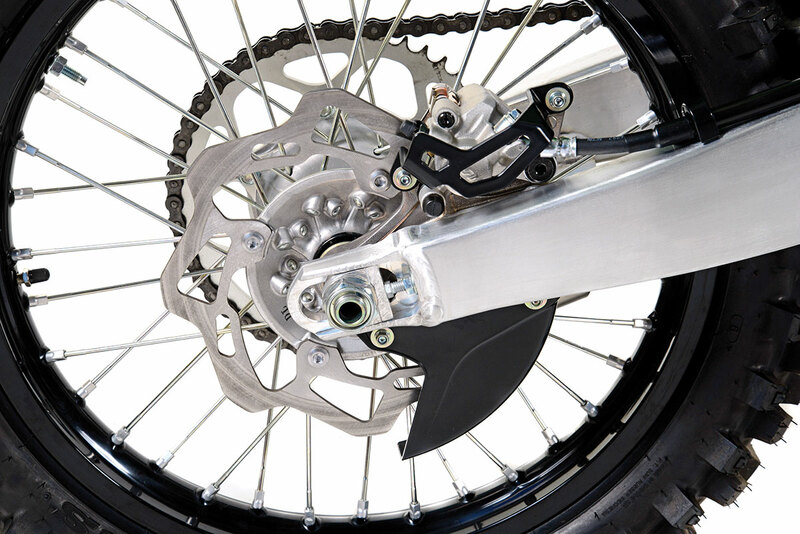 We know that some riders insist that they like the feel of a cable-actuated clutch. To us, this is like Aussies who say they like the taste of Vegemite. It just proves that you can get used to anything. The new clutch is very smooth, and the engagement always happens right when you expect it. Some riders commented that the action was too close to the grip, and there’s no easy way to adjust this, only to change the reach. 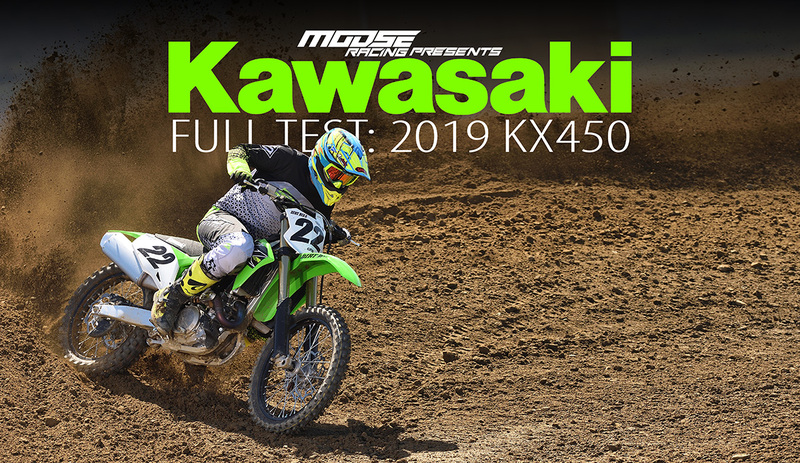 The pull isn’t necessarily any lighter than it was with the 2018 model, either, but that’s only because the Kawasaki already had the lightest clutch pull in the 450 class. It still does. We weren’t even thinking about the new brakes until the first ride. Kawasaki brakes have been weak for a long time, but now they might be the strongest on the market, even compared to Euro bikes. We love the side-access air filter. We also like the quieter muffler. We still like the fact that the bike is very adjustable. Not only are there four handlebar positions, the footpegs can be moved 5mm downward for riders with long legs. The only things we have to complain about are the short, hard grips and the 7/8-inch handlebar. We think Kawasaki deliberately gave us this stuff just to be sporting. 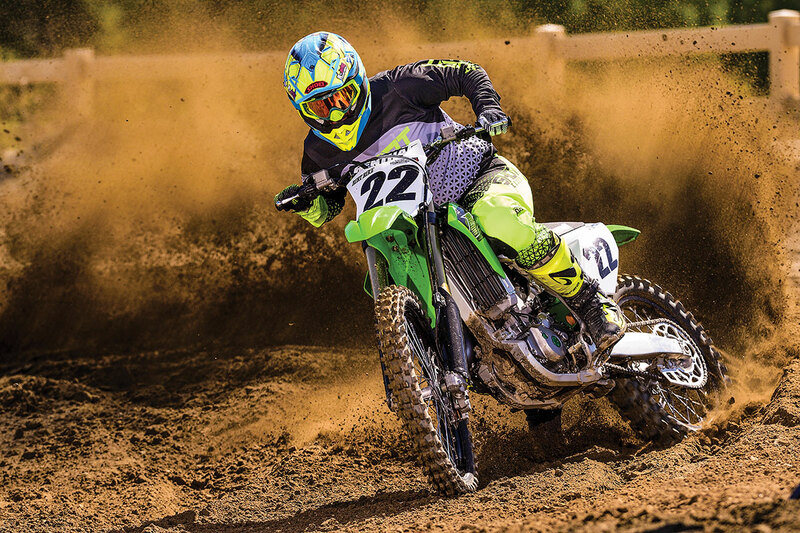 The new KX450 is more than just good. It’s a truly great motorcycle that proves what Japan can do.